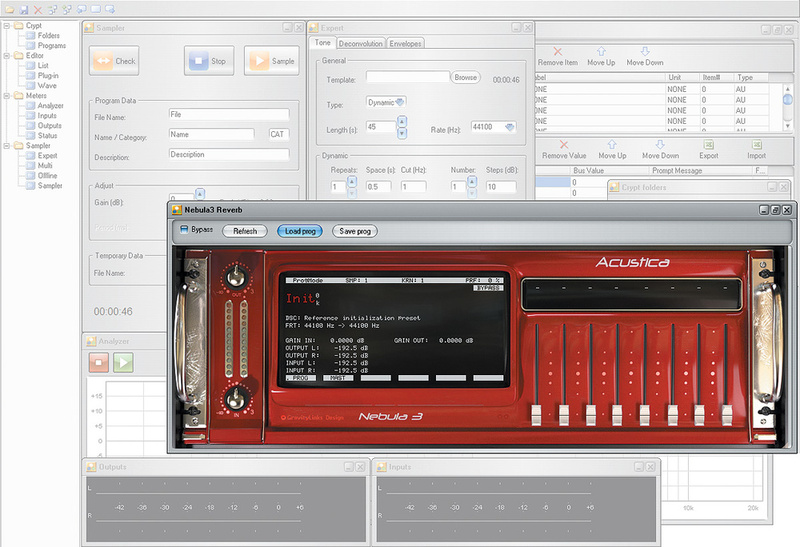 Acustica Audio's Nebula uses 'samples' of real preamps, processors and effects to process your audio. It's a different approach from other plug-ins and the results sound amazingly authentic, particularly if you invest in a decent third-party Library. But Nebula also offers the tantalising prospect of 'sampling' the sound of your own outboard gear, using the NAT sampler application that comes bundled with it. NAT itself is quite complex, and its user documentation is 'lightweight' (to put it mildly! ), so to help you get started, I've written this step-by-step guide. I'll explain how to go about sampling preamps, capturing both some of the dynamic behaviour they exhibit (the ways in which their response changes according to input level), and the harmonic distortion they add to a signal, which is responsible for a lot of the 'colour' imparted by analogue gear. Then I'll demonstrate how to capture a 'dynamic reverb', to give better results than can be achieved with standard convolution techniques. A follow-up article will explore the techniques used to capture devices with multiple controls, using an EQ as the main example. I'll also give you a few tips on making the resulting Programs (ie. the presets, or Libraries, that you're creating to load into Nebula itself) more resource-efficient. The methods described are intended to yield very good results, but because this guide is aimed at beginners to NAT sampling, they're not necessarily going to be the best possible results. The techniques required to achieve those become increasingly specialised and experimental. Specifically, I won't get into how to capture the sound and action of dynamics processors such as compressors and limiters, or time-variant effects like tremolos and flangers. This isn't just because I'd be a fool to give away all my commercial secrets: such processors are so complex to capture accurately that it would be difficult for me to write a beginner's guide even if I wished to. If you want to go on and work with more complex equipment, you really need to gain experience with simpler gear in any case, and following this guide should still be well worth the time and effort. It's also worth bearing in mind that you can still use the techniques described here to capture something of the sonic character of, say, a compressor or limiter, even if you can't recreate its gain-reduction behaviour. For instance, you might be surprised at the quality of the results you can achieve by capturing a 'snapshot' of a variable-mu compressor in this way, then using the resulting Nebula Program alongside a more conventional transparent-sounding compressor plug-in in your DAW, which can take care of the gain-reduction side of things. 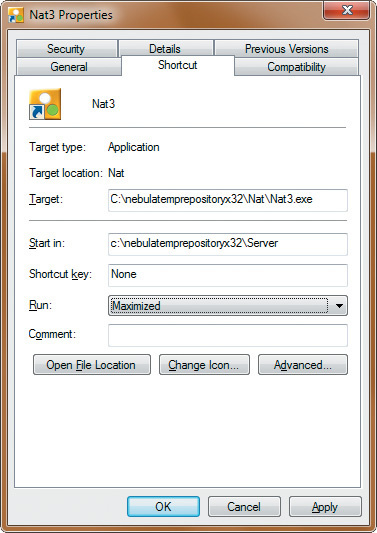 You'll need to install Nebula 32-bit in order to access the NAT sampler, which you'll find in the associated Nebula Temp Repository folder. It will not be installed if you only installed Nebula 64-bit. NAT is automatically installed when you install Nebula, but because Nebula comes in 32-bit and 64-bit versions for both Mac and PC, and NAT is currently only available as a 32-bit application for Windows only, would-be users often struggle to find everything they need. I recommend that you install the 32-bit version of Nebula first, to ensure you have the NAT sampler. You can then install the 64-bit version of Nebula on top — this can still load any Libraries you create using NAT. The Mac OS X version of Nebula can load the Libraries you create, but you'll need a Windows machine to run NAT. 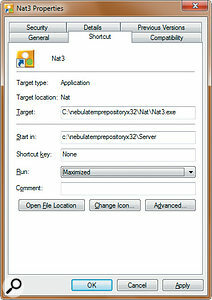 Note that different versions of NAT are bundled with different versions of Nebula, and while anyone with any version of NAT should glean plenty of useful tips and information from this tutorial, you'll need the full version of NAT3 if you wish to follow my examples step by step, and NAT3 is bundled only with Nebula 3 Pro and Nebula 3 Server. Before you do anything else, configure NAT to use your audio interface. Make sure your interface is connected and switched on, and route the output channels you want to use directly back into the input channels. It's important to use a physical cable rather than your interface software's internal loopback facility. Then, in NAT, go to Settings/Audio Settings to select the ASIO driver for your interface, the input/output channels you want to use, and the desired sample rate (more on this later). Clicking the 'check' button in this window sends a signal through the loop to calculate the latency. Click quit, and you'll be prompted to save the settings (do it!) before closing and restarting NAT. Before doing anything else, you need to configure NAT to use your audio interface, just as you would with a DAW, and then perform level calibration. To start sampling, you'll need both a Session file and a Template file. 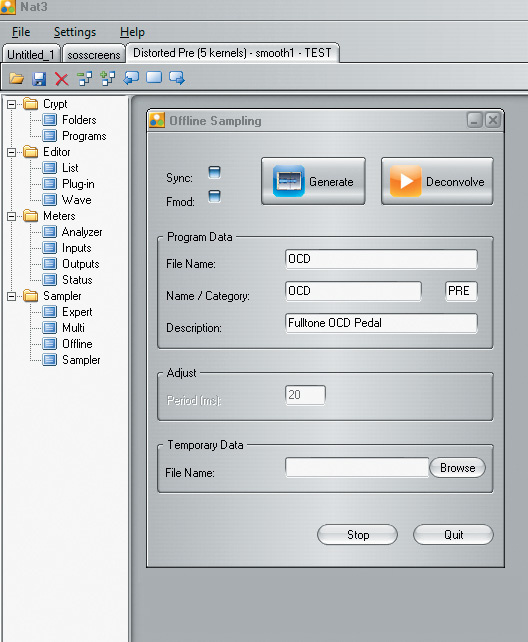 The Session file is where all your customisation of NAT's adjustable settings is saved; it tells NAT how many samples to capture and how to structure them, amongst other things. The Template XML file lays out how the captured samples will be used by Nebula, along with other details about how the final Program will work. An 'archive' of the Sessions and Templates currently available for Nebula can be found on Acustica's web site but just to be sure we're all on the same page, I've put the latest versions that I have on my system on the SOS web site, at www.sosm.ag/nebula_nat3_media, along with various other useful bits and pieces. These include some of my own custom Templates (see the 'Tim's Template Tweaks' box later). If you plan to work through this guide with NAT in front of you, go and get these files now, because you won't be able to proceed without them. NAT allows for two slightly different approaches to sampling, which it calls Offline and Online. As you become more adept and more ambitious, you'll probably lean towards the Offline approach, which becomes more efficient once you know what you're doing. It also enables you to tailor the results manually, to make your Nebula Library less demanding of computing resources. While feeling your way around, though, it's much easier to use the Online method, as NAT will handle all the recording and file organisation for you. This guide will focus predominantly on the Online approach; I'll describe the Offline method next time. Finally, remember that whether you're slavishly following the examples or are embarking on your own sampling adventures, it's best to create a new folder on your hard drive for each and every sampling project. The sample-capture process creates a lot of similarly named files, and if you fail to keep everything for each project in one place you'll quickly confuse yourself. 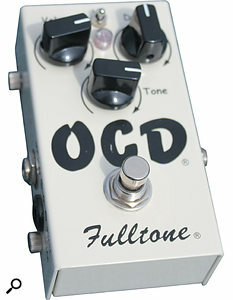 The Fulltone OCD guitar pedal used in the 'preamp' sampling example — this pedal highlights both what can and can't be achieved using Nebula!Now for some practical examples, starting with a guide to sampling a preamp. Or, rather, a guitar pedal, because instead of capturing something as subtle as a mic preamp (which NAT is particularly good at), I chose as my target a Fulltone OCD guitar pedal. Why? Simply because it can be sampled using exactly the same approach but the results will be more harmonically complex, and therefore more obvious, which makes it particularly good for demonstrating how far you can take this process before things start to go wrong! As I hinted above, any complete signal path can be captured using this method, as long as it doesn't include time-variant modulation, isn't a reverb, and doesn't have multiple controls that you want to recreate in the final Program. When you restart NAT after configuring your interface, go to File/Open, and choose a Session file that most closely matches the kind of Program you want to make. For preamp sampling, I recommend going into the Offline Presets folder in the Sessions/Templates archive, opening the Preamps folder and choosing the 'Distorted Pre (7 kernels) — smooth2 — OFFLINE.xml' Session. In case you just did a double-take, yes, I know I said we'd be doing Online sampling — we're using an Offline Session in an Online project. There's very little difference between Offline and Online Session files, and this one happens to be closer to what we need than any of the Online ones, partly because it was created more recently than the nearest Online equivalent. Go to File / Save As to save the Session you just opened into the folder you created for this project, using a filename that describes what you're sampling. If you value your sanity, include the phrase 'NatSession' or something similar; tempting as short filenames may seem, you're going to create a lot of files in this folder, so you want to keep the names as descriptive as possible. Each sampling project is based on a Session file, selected from Acustica's 'archive'. Speaking of names, you need to tell NAT what to call the various files it creates and how you wish users to identify the Program from inside Nebula. 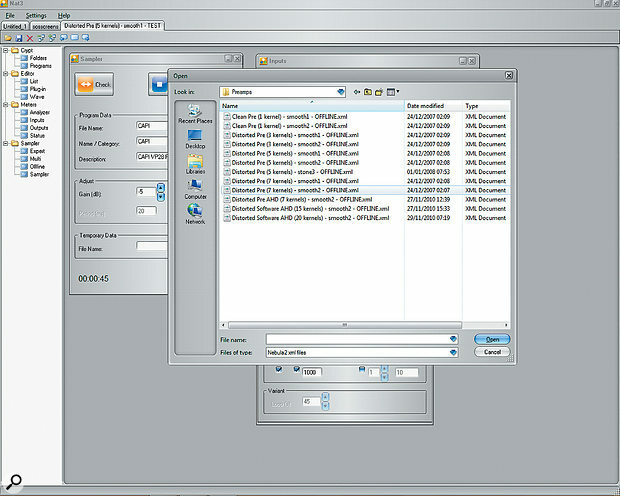 In the column on the left of NAT is a folder called Sampler, and within that a window that's also called Sampler. Open this. In the Program Data area there's a File Name field, which is where you enter the filenames to be used by the Program you're creating. Just below that is the Name field, in which you enter the name you wish to appear inside Nebula. You also need to enter a Category name, comprising three capital letters. 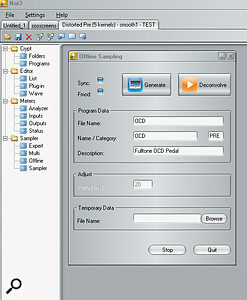 This assigns the Program to a category in Nebula's drop-down Program-selection menu. You can use one of the existing categories (such as PRE for preamp Programs) or create your own categories. Creating a TST category for when you're testing new Programs like this might not be a bad plan. Finally, there's a Description field, which allows you to enter the short description of the Program which is displayed inside Nebula once the Program has been loaded. To instruct NAT how to manage the data it creates during the sampling process, go to the Temporary Data filename entry field and click Browse. Navigate to the folder you made for this project and pick a name for the WAV file that will be recorded by NAT during the sampling process. Then, open the Expert window that's found in the column on the left and select the Deconvolution tab. If what you're sampling has only a single channel, put a tick in the Mono box, but if it's stereo, make sure this is unticked. I recommend unticking the 64-bit box, as the 32-bit results seem to null pretty much perfectly with the 64-bit impulses. So if there's a difference, it's imperceptible — yet the 64-bit Programs take twice the RAM, disk space and load times! The three tabs of the Expert window, where you make most of the tweaks that will perfect your Nebula Library: the Tone tab is where you define the dynamic range that will be captured, and the space between each sample; the Deconvolution tab includes controls for determining how many harmonics will be captured, and therefore both how realistic and how resource-hungry your Library will be; but you can ignore the right-most one (Envelopes) for now, as this is only required when sampling compressors. The mysteriously named Volterra Orders box tells NAT how many harmonics are required in order to recreate the hardware sound convincingly. In essence, using more kernels allows you to recreate more of the harmonics, but it also results in a more CPU-hungry Program, and as half the battle of creating good Libraries is to capture what you need without putting too great a load on your computer, this setting is important. If what you're sampling adds much harmonic distortion that you wish to capture, go ahead and raise the number in the Volterra Orders box up to 10 to make a full 10-kernel Program. If it's quite a clean-sounding preamp, you can set it at seven — possibly even lower — without compromising the result. (If it's really clean-sounding, there's little point in sampling it!) When you have time, it's worth conducting some blind tests to judge the differences for yourself; you might be surprised by how few devices need full 10-kernel Programs to sound very convincing. Everything else in the Deconvolution tab should be left alone, and you can ignore the Envelopes tab too, as that's only used for compressors. In the Tone tab, you need to set the sample rate to whatever rate you're using and want your final Program to be. Ideally, this should be the rate you intend to use the Program with, but Nebula will, in any case, automatically convert the impulses to your DAW project's sample rate when required. Programs with higher sample rates obviously use more computer resources, though this is going to be more of an issue when you get on to thirstier recreations such as reverbs (of which more later). The Dynamic area is where you'll make the most important tweaks to your first Programs. The main areas of interest are the Number and Steps boxes; leave the Stone and AHD stuff alone for now. The Number field is where you decide how many dynamic samples NAT will capture, whereas Steps dictates the 'distance' between those steps, measured in decibels. These boxes should have 30 and 1.5 in them by default, which would sample a 43.5dB range, with 1.5dB between each step. Usually, this is a good setup. When adjusting these numbers, you need to have calibrated your input and output levels — if you're uncertain about that in any way, read the 'Level Calibration' box. Obviously, you want to capture a nice wide dynamic range (ie. a good 'span of decibels') and a good way to see what kind of range you can sample is to do a quick test. The Sampler screen is where you define all the filenames, as well as where your Library will be found and how it will be described in Nebula. If there's hard clipping in any of the tones, go back and recalibrate your levels; Nebula cannot recreate hard clipping. If the quietest tone sweep is well above the noise floor (40dB or more), increase the range being sampled by adding more steps (by increasing the Number value) or by increasing the number of decibels between the steps (increasing the Steps value). If the quietest tone is barely above the noise floor, reduce the number of steps or the dB distance between them. 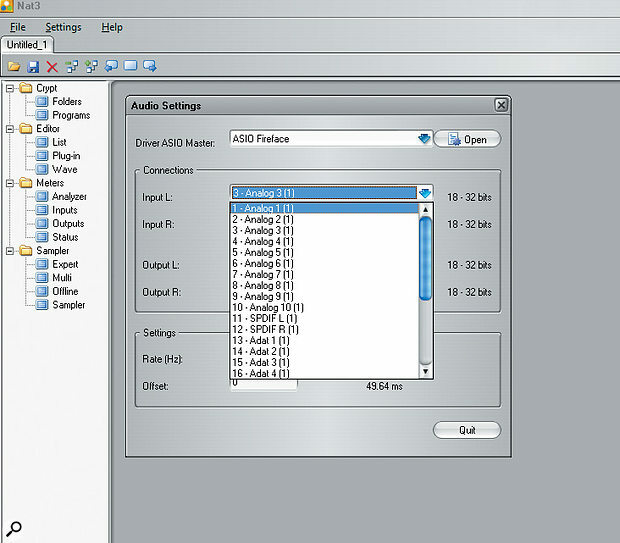 Another option is to use the Repeats parameter, which can lower the noise floor by several dB. Two repeats can increase your signal-to-noise ratio by up to 6dB, four repeats up to 12dB, and eight up to 18dB. The trade-off is that you increase the sampling time by a multiple of however many repeats you use — and when you sample for real, the tone sweep length will be increased back up to 45 seconds, so a few repeats can take over an hour, easily! If you want to try using repeats, go ahead and set it to use a few — but given the time this takes, it's probably better to practise getting the other things right first. After making any adjustments, hit Sample to do the recording again and check the resulting waveform. Keep adjusting and checking in this way until you've found the maximum range you can achieve without clipping the louder samples, while keeping the quieter ones nicely above the noise floor, and with a desirable spacing between the samples. This spacing can directly affect the sound quality of the final Program, so you may want to spend time experimenting with it, but 1.5dB is generally a decent starting point. When you're happy, increase the Length parameter back to 45 seconds and save your Session. Finally, you're ready to actually sample something. Hit the Sample button and wait for the process to complete. It will take some time — how long will depend on the settings you've chosen, but NAT will give you a clear indication of the time it will take before you start. At the end of the process, you should have a Nebula Program to check out. Copy or move the N2P (Program) and N2V (Vector) files that NAT placed in your Project folder to Nebula's Programs and Vectors folders, respectively, and load Nebula to check out the results. If you can't see the Library in Nebula it means that Nebula's looking in the wrong folder — note that even the 64-bit version might be set to look in the 32-bit folder by default. (You can change the default folders if you want, or add alternative folders, by opening and editing the Nebula setup XML files for either the 32- or 64-bit version of Nebula.) If you're happy with the Program you've created, great. If not, read back over this article and decide which steps you got wrong! Nebula is not without limitations, particularly when it comes to very high levels of distortion. If you sample something that heavily distorts the input, your results are likely to be pretty bad; they certainly won't accurately reflect the hardware. Nebula is definitely at its best when recreating softer saturation rather than full-on distortion. To illustrate this point, I used NAT to create three Nebula Programs from the Fulltone OCD pedal, with various settings of the pedal's Drive knob (with the other knobs always in the same positions). Each Program uses all 10 of the available kernels, so they all capture the maximum number of harmonics possible. As you can hear if you download the Programs (www.sosm.ag/nebula_nat3_media) and load them into Nebula, the one with the least amount of drive sounds best. It's also the one that most closely represents what was actually sampled. The second, with a bit more drive, is less accurate, and you should notice very audible artifacts when passing certain sources through Nebula. The third, the full-drive Program, suffers from lots of artifacts; as you can imagine, it's not accurate at all. Even the one with the least amount of drive can produce artifacts with certain sounds and high input levels, because — being a distortion pedal — it can't be completely accurately recreated. Nonetheless, the Program can sound very close to the pedal at the setting that was sampled in many cases. You should be able to deduce from this, and from listening to the Programs that ship with Nebula, that capturing the sound of a microphone preamplifier, which creates more subtle distortions, is well within NAT's capabilities. So, now you know how and you know the limitations, you can go and sample your preamps to your heart's content! Reverb Programs demand much more CPU power than other types of Nebula Program, and much more than straightforward convolution reverbs, too. This throws up a couple of important questions. First, why it is that you want to use the Nebula/NAT combination instead of the standard impulse-capture/convolution-reverb technique? Second, if you decide that you do want to use NAT, how many kernels do you really need to capture to achieve a decent result? To answer the first question, consider whether there's any harmonic distortion that you wish to capture, and whether the behaviour of the reverb changes according to the input level — because those are the two things NAT/Nebula can do that other convolution systems can't. For most digital reverbs, whether hardware or software, there's unlikely to be much by way of harmonic distortion. Don't expect to get a Nebula Program to recreate the low word-length grit that some older reverb units may have, but the analogue stages of older outboard units may add some subtle distortions. I'm also not aware of any devices that react dynamically to the input signal level either. Unless you plan to capture multiple controls, then, there seems to be little reason to use NAT and Nebula to capture 'clean' algorithmic reverbs. If you want to try this to compare the results for yourself, a single-kernel Program should be sufficient, though for those older units you may want to raise the kernel count slightly to see if anything useful can be captured. One final thing about digital reverb units that you need to be aware of is that some use modulation on the wet signal in order to achieve a subtle chorus-like effect. If a device does this, then you'll need to disable it if the unit allows — and if the unit won't allow you to disable it, you should probably forget about getting a good result from it, because those modulations will throw out NAT's calculations. Mechanical (ie. spring or plate) reverbs are a different prospect, though, as are miked-up acoustic spaces. In both cases NAT/Nebula does the job much better than traditional convolution. It's likely that there will be some interesting harmonics to capture, and there may also be resonances that cause the response to change with the input level. Even for slightly warmer-sounding devices, though, you should probably only go up to three kernels, or six at the most. 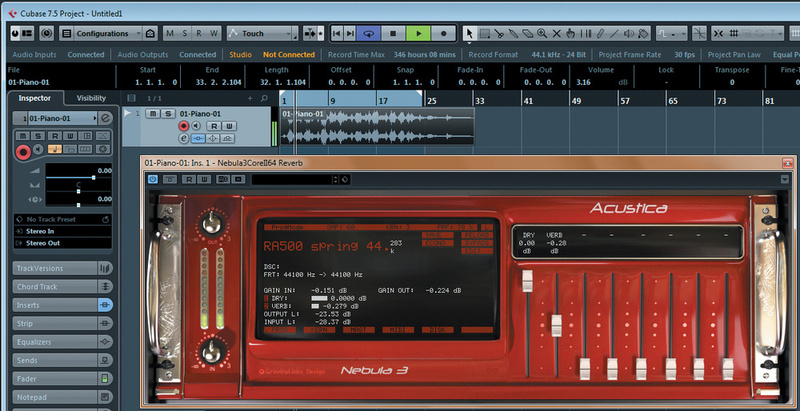 That should capture the sound without placing an unnecessary load on the CPU when using the Program in Nebula. The quirky Sansui hi-fi reverb, on which the walkthrough reverb-sampling example is based. By way of example, I'll walk you through the capture of a Sansui RA500, an old spring reverb unit that was originally intended as part of a home stereo system. Make a new folder for this project, then open the Distorted Reverb (0,5 sec).xml Session from the Sampler Presets Reverbs set in the Sessions/Templates collection. Fill out all of the names in the Sample window (don't forget the WAV filename). In the Expert window's Deconvolution tab, repeat the instructions for the Fulltone OCD example, but keep in mind that you can only have up to three kernels unless you change the Template — and then you can only have six. It's possible to go higher if you must, but (a) you shouldn't need to and (b) you'll need to modify the Template. To allow up to six, go to the Tone tab and click 'Browse' by the Template entry field, then find and select the Template_reverb_2e (6k).xml Template file. Save your changes as a new Session file in this project's folder. Use the same method as with the preamp capture process to determine how many dynamic steps are required, and the optimum size of the steps between them. Remember, more dynamic steps means more samples, and since reverb impulses are longer, that means more RAM, more disk space and longer load times — so you may want larger gaps and fewer steps. You can use repeats to lower the noise floor for reverbs too, but it doesn't always work so well. When you use repeats, NAT records the entire set of tone sweeps at every dynamic step, however many times you tell it, then it averages those recordings down to one. If it works, it's a great way to get some natural noise reduction that's free of any of the artifacts you get with typical noise-reduction methods, and it gives NAT a better signal on which to perform its mathematics. For the Repeats function to work well, though, whatever you're sampling must provide a fairly consistent result every time, with regard to the phase of the recorded tone sweeps. With something like a plate or spring this won't usually present any problems, but with acoustic spaces, a subtle change in temperature, for instance, over the hour-plus time that you're doing the sampling could affect the speed of the sound waves just enough to alter the phase of the later recordings — and that would cause phase cancellations during the averaging process. With digital units, connected digitally to your interface, or plug-ins, you probably won't need Repeats. 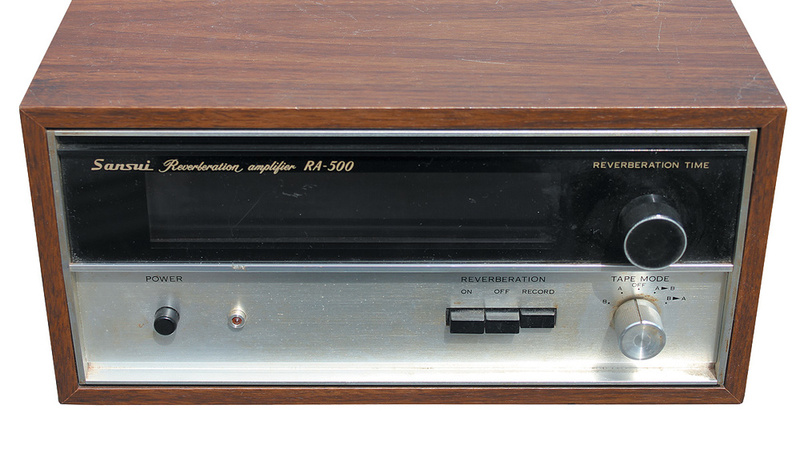 For the Sansui unit I sampled for this guide, I used six Repeats. This took a while, but it was worth the time because it lowered the noise floor by about 14dB. If you aren't using Repeats, set the Repeats parameter to one, rather than zero. The author's Sansui R500 patch, running in Nebula x64 in Cubase 7.5. Note that the controls have been tweaked from the standard Nebula ones, to make them less confusing. The Space parameter dictates how long your reverb tails can be. The rule of thumb is to set this to twice the length (in seconds) that you want your reverb to be. The Length parameter is also important. When sampling reverbs, you might sometimes get a Program where the tail of the reverb has phasey artifacts in it. I haven't been able to pinpoint exactly what causes this (if you figure it out, come into the Acustica NAT sub-forum at http://sosm.ag/acustica_nat_subforum and let us know! ), but I have noticed that increasing the length of the tone sweeps with this setting can reduce or remove them. I set it to at least 60 for reverbs, always. Clicking the up arrow will only allow you to get a maximum of 60 seconds, but you can enter a higher number directly in the box. Don't go too high, though, because NAT is only 32-bit and it will soon hit its allocated RAM limit if the WAV file is too big, which means it won't be able to make a finished Program. When you're done, save the session, tell NAT to sample and, if all goes well, you should have a reverb Program to try out. It's worth mentioning that I created both 44.1 and 96kHz versions of the Sansui reverb Program, and to use the 96kHz version you'll need a powerful modern PC. The editor of this article tested the patch on his 3-4 year old Intel i7 965 quad-core PC, and while the 44.1kHz version was usable, the 96kHz one almost brought the system to its knees! That pretty much concludes the first part of our NAT sampling tutorial. If you've followed it, you should now be able to capture the sound of things like mic preamps, console channels and so on — albeit without capturing multiple controls. You should also be able to recreate the sound of a reverb unit or real space, complete with any harmonic distortion and resonances caused by the device or room. And you should be able to load the basic results of this sampling process in Nebula, to use them within your DAW software. If you want to skip all that and try the experimental patches I created in preparing this article, you can find them on the SOS web site along with the other downloads. Next time, I'll explain how to capture the sound of a device that has multiple controls, using an EQ as a walk-through example. I'll also offer you a few more tips and tricks that you can use to refine — and hopefully shorten — the overall sampling process, and I'll discuss how to use the Offline method of sampling to make the Programs you create more resource-efficient when loaded into Nebula. Tim Wisecup is the man behind Cupwise FX, one of the leading developers of third-party Libraries for Acustica Audio's Nebula platform. His releases encompass Libraries based on well-regarded hardware including a Neve 33609 compressor-limiter and some UREI filters, as well as a collection of more quirky analogue gear, including guitar pedals, reverbs and various things using tape and tubes. For more details check out his web site at www.cupwise.com. There's been a push in the community for all Nebula Program developers to use the 0VU = -18dBFS RMS standard. For devices like preamps, compressors and EQs, it's as good a standard as any to follow if you want consistent results. If your gear has input VU meters, calibration is easy: go to the Adjust area in NAT's Sampler window and set the gain parameter to -15. Hit the Sample button and adjust the input gain on your hardware until the VU meter hovers at around 0VU. You need to do this before the first 45-second tone sweep ends, so hit Stop then Sample if you need more time. When you're done, hit Stop and set the NAT gain parameter back to 0. Note that some gear may expect to 'see' hotter or quieter signals at their input than others, and it's up to you to decide on a case-by-case basis whether using this calibration standard makes sense. For the guitar pedal I've used in this example, and for other distortion effects/processors, using a specific standard isn't really important, and you just need to follow your own judgement. If you aren't calibrating to any standard, a good rule of thumb would be to adjust levels so that a full-scale digital output goes into your gear a little bit below the level at which hard clipping occurs. While there are some similarities between Nebula and more conventional convolution-based software, there are some important differences. One of the bigger ones stems from the Volterra maths that powers this beast — or, put more simply, its ability to sample up to nine orders of harmonic distortion, on top of the fundamental. Another important difference is that Nebula can go beyond static convolution, by using controllers commonly found in synthesizers (such as envelope followers and LFOs) to modulate (crossfade) between different samples during convolution. This opens the door to a whole world of possibilities, of course, but the most common use allows for non-linear dynamic behaviour to be sampled and recreated. In other words, it can capture the 'character' of your outboard gear, complete with the action of some of its controls, and that's something no other software can do. The latest versions of Nebula (3.0 and 3.5) were reviewed in SOS in February 2008 and January 2012, and those articles are free to view on the SOS web site. I've created some custom Templates that you won't find in the Acustica Audio archive, and you can download these from the SOS web site at the URL given below. My Templates produce Programs that strip away all the controls that I feel are unnecessary for certain patches — and are usually confusing to new Nebula users. These include the Attack, Release, and Liquidity controls in both the preamp and reverb types. Preamp Template: I've added the 'trim' control to the preamp Template, and this acts as an input drive control with automatic output compensation. So if you set it to boost input by +5dB, it automatically lowers the output by -5dB. This allows you to find the 'sweet spot' for your input quickly. I've also renamed what was called 'drive' in the Acustica Template to 'dist' in mine, because I feel that 'drive' is misleading and 'dist' is more accurate; the control just adjusts the volume of the harmonics, rather than increasing the amount of input drive to generate more harmonics, which is what my 'trim' control does. Adjusting the 'dist' control breaks the natural relationship between the fundamental and the harmonics, but sometimes it's good to be able to either increase or decrease it. The vast majority of the time, it sounds best if you leave it alone. Reverb Template: In the reverb Programs you'd get using Acustica's standard Templates, there are three controls for mixing the signals that come out of the Program. My Template retains the 'dry' control but defaults to zero, so there's no dry signal coming out. You can use the control to introduce as much dry signal as you wish, but I think Nebula reverbs work best as send effects rather than inserts. Next, the Acustica Templates had 'FX1' and 'FX2', which were mixer level controls for the main reverb signal and the harmonics levels, respectively. So 'FX2' is basically the same control as the Acustica's 'drive' control. I removed it from the reverbs, because I feel it's even less useful here than it is with the preamp-style Programs. I've replaced both controls with just one, called 'verb', which adjusts both the fundamental reverb component and the harmonics together (thus maintaining their natural relationship). There are a few other changes 'under the hood' which have to do with how the samples are used, and which I feel give more authentic behaviour for each type of Program. I'm not going to explain that stuff because it's fairly advanced. Lastly, both of my custom Templates allow up to 10 kernels, while many of the Acustica Templates are limited to fewer. Loading Templates: To use these, select the Session for a preamp or reverb Program, as described in the main article, then go to the Expert window's Tone tab. You'll find a section that allows you to load a different Template. Try using the default Template to create the first Program, and then my custom Template to create a second so that you can compare the results. Make sure you enter different file and Program names in the Offline Sampling window for each version, and then click 'Deconvolve'. Whatever you do, don't click Cancel when you're trying to load a Template, as there seems to be a bug that can cause NAT to crash when doing this! There are lots of Session files to choose from, so how do you decide what to use? The preamp Sessions will tell you how many kernels they are set up to give you, but if you see any file whose name includes the word 'Clean' you can tell instantly that it will produce a single-kernel Program. You can always lower the kernel amount before deconvolving a Program, without a problem, but if you increase it above the amount the Session is set for, you will need to pick a template that allows for the amount of kernels you want. So the best idea is to pick a session with the largest kernel amount offered. When sampling anything with dynamics (with the exception of reverbs), always pick a 'smooth2' Session. The 'smooth1' Sessions are older and pretty much obsolete. You can ignore the 'AHD' sessions, too, because the AHD technology was never perfected. Stone sessions allow you to sample things and have NAT flatten the frequency response. I've never used these and haven't explained how to in this guide, so unless you want to experiment with that yourself, you can also ignore any Sessions with the word 'stone' in the filename. I've discussed the selection of Sessions for reverbs in the main article — essentially, just pick one of the 'clean' Sessions unless you're sampling a reverb with dynamics or harmonic distortion (ie. electro-mechanical reverbs such as springs/plates, or acoustic spaces). The filenames tell you the length of reverb you can capture, but you can change that by increasing the amount of time between each tone sweep, so really the only thing to consider with picking a reverb session is how many kernels it offers and whether you're going to need them. With multis and EQs (to be explored in another article), the Session filenames tell you how many controls you can sample on a device. If they say 'switch', then they're set up so that the final Nebula Program will jump from one sampled position to the next, like a switch. Otherwise, you get a smooth crossfade between the sampled positions. I'll go into more detail about this in the EQ guide, in a follow-up article, but if you'd like to experiment before then, I'd recommend picking one that says 'smooth2'.